The 1st Colour you choose is for the part of the decal shown in Red, the second colour is for the part of the outline shown in black and the 3rd colour is for the part of the decal shown in Silver. 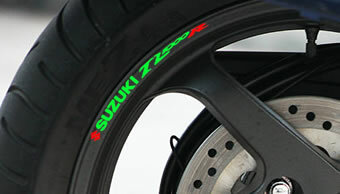 14 perfectly cut Suzuki TL 1000R decals in Red, Black and White as shown. 27 perfectly cut Suzuki TL 1000R decals choose your colour below.